Sustainable Games: We believe that games are the most advanced and eloquent form of communication that we as humans currently have at our disposal. As such, what drives our game designs is the question: What is it the world really needs us to communicate? There can never be a single or definite answer to that question as the world constantly changes and thus the need constantly changes - but keeping the question in our awareness brings forth an endless creative flow which eventually expresses itself into joyful fun game experiences. Experiences that are designed to enliven your true joyful nature. While we strongly believe in multiplatform development and seamless multiplatform experiences, we're fully aware that we're literally at the dawn of a new age and immersive Virtual Reality plays a rather significant role in that "new age". 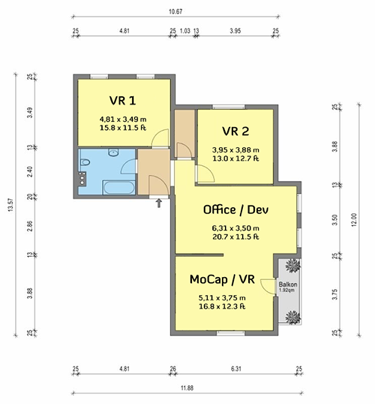 So starting June 2015 we'll have a nice new office-space with two rooms dedicated purely to and perfectly suited for testing new VR multiplayer experiences. VR is the new frontier and our primary focus is paving the way to this new dimension. Of course, we're also doing development for mobile, desktop and Web. Your Games: If you need to communicate something but you don't feel you can get it done in a game, or you'd just like to get some support creating a game in Unity, we're here to collaborate. You could also call that contract work - but what this is really about is bringing forth the best mutual benefit for everyone involved: Your players, your company, and us. Feel free to check out some projects we were involved in. Game Development Tools: We strongly believe that the true meaning of work, the way it was really meant, was having a lot of fun while being productive. The only difference between working and playing should really be that working results in some sort of product or service. That's why we're using the Unity game engine: It's an incredibly fun tool to work with. And Unity's authoring environment can be extended to make it even more fun. So, when we create something we feel might be useful to our game development companions, we release it on the Unity Asset Store for you to purchase. We call that "sharing the love", and we mean it! Jashan Chittesh, founder and CEO of narayana games has just recently published his first book "Das Unity-Buch" (currently only available in German language), which is a 512 page introduction to the Unity game engine that starts with 2D and finishes with Virtual Reality. The next book will be in English, focus on multiplayer game development with Unity (again, from 2D, via 3D to VR) and will be timed with the release of the second phase of the new Unity Networking.